China Manufacturer Travel Lift For Sale Has Wide Application Various Types Reasonable Design Low Price! China manufacturer travel lift for sale is cost-effective choice for customers. China supplier sales travel lifts with reliable quality and factory price! 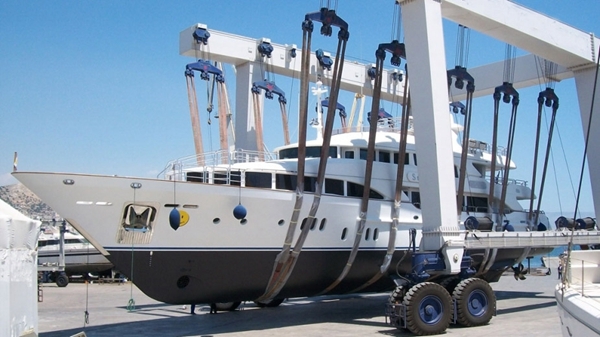 According to lifting capacity, marine boat hoists include large capacity travel lift, small duty travel lift; according to different occasions, mobile boat travel lifts have construction boat hoist, travel lift for water sport meetings, aquatic clubs and voyages, shipyard travel lift and yacht boat hoist. According to features, travel lifts have ISO approval marine travel lift, factory direct sales marine travel lift, safe driving steady travel lift, cabin control travel lift. All those boat hoist gantry cranes can be provided by a famous China manufacturer, Ellsen Group. Ellsen designs and produces boat hoists based on strict national standards and customers’ practical needs. Buy Ellsen boat lifts for steady performance, great efficiency, high safety and simple operation. Ellsen also provides customized service! Thus customers can purchase the most suitable travel lift! Buy Ellsen boat hoists now for more benefits! 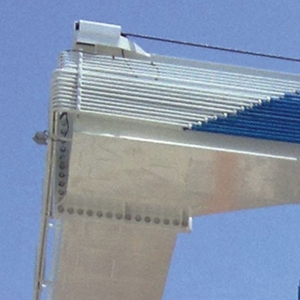 What is the structure of marine travel lift gantry crane? Maine vessel hoist crane has terse structure. 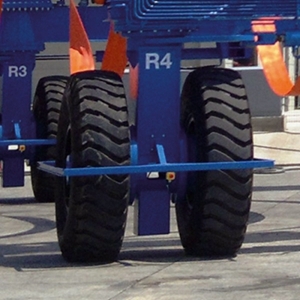 It includes main structure as beam, outriggers, travelling mechanism, u shape frame with belts; travelling wheel block as rubber-tyred for easy operation on the ground or the deck; hoisting mechanism for lifting different tons of goods; steering mechanism, steer it in the cab with good lighting system; hydraulic transmission system is driven by hydraulic; electric control system, remote control or cabin control is for option. Ellsen designs the c-beam based on practical needs. The optional upper cross-beam is extended forward from the front of the columns. In this way, the whole structure can provide an improved clearance for sail-boat rigging, pilot house and other craft. It is designed to optimize space for maneuvering and docking. All steering groups are operated by IMO certified motorized slewing bearings. Each slid-able lifting point has independent and synchronized control. 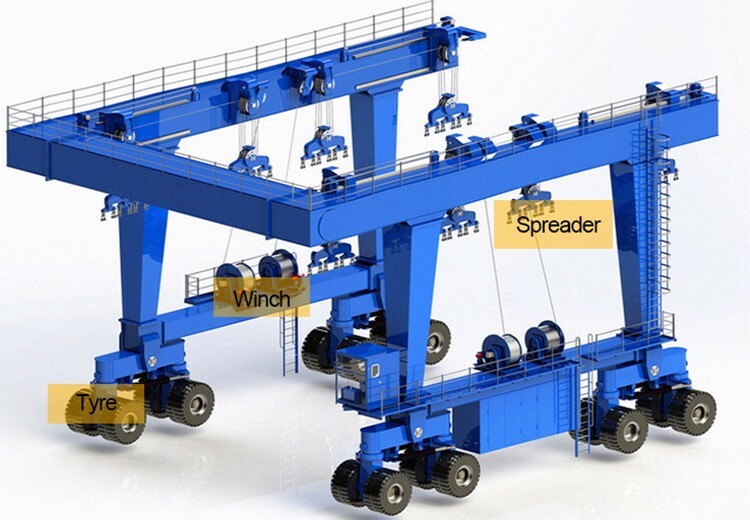 Even the number of winches on each side is depending on the size and capacity of each travel lift. Engine compartment houses a standard Tier 3 Iveco, water-cooled diesel engine complete with soundproofing and watertight covering. 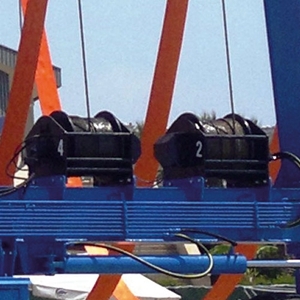 Sliding lifting points are combined with synchronized winches. 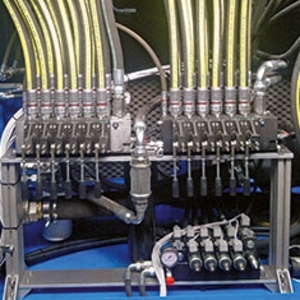 They are controlled by proportional valves, and allows independent raising and lowering of the load. The ultimate in safety, two remote controls come standard with every machine. It includes a display and scale system showing total and partial weight fore and aft. For yards with shifting or uneven terrain, it allows all four wheels to help maintain contact the ground. 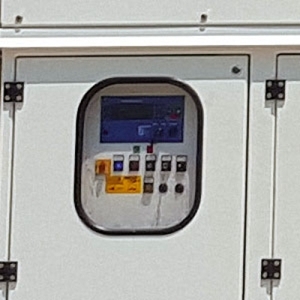 Remote assistance service allows us to connect to the machine wireless to troubleshoot and diagnose any issues. Problems can often be fixed over the phone. 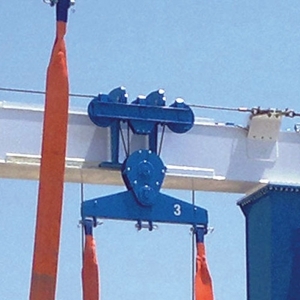 What are safety devices for boat hoist crane? Marine boat hoist crane is kind of heavy duty crane, thus the safety is very important! How to ensure the safety of heavy duty travel lift? The key point is complete safety protection devices. Ellsen provides boat hoist crane with safety devices as overload limiter, lifting limit switch, travelling limit switch, anti-collision device, main isolation switch, emergency stop system. Reliable travel lift manufacturer is important for customers. 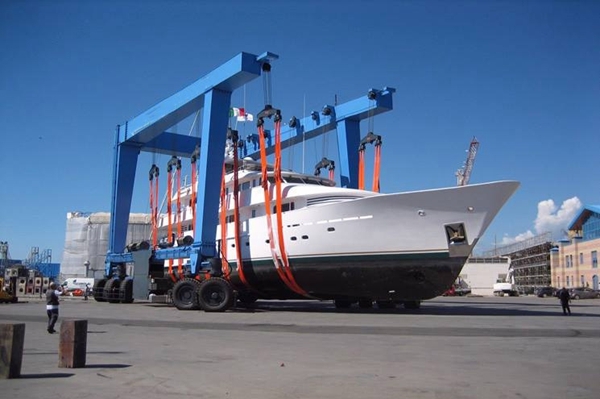 Strong boat hoist manufacturers can provide top quality boat lift, customized service, reasonable crane design and perfect after-sale service. Such package service makes customers satisfied. China travel lift suppliers are honest and sincere, thus many customer all around the world want to buy marine boat lift from China. The price is affordable, the performance is great. Ellsen Group, a professional travel lift supplier in China, provides types of boat hoists for sale, such as construction travel lift, dock travel lift, u shape boat lift, shipyard boat hoist. 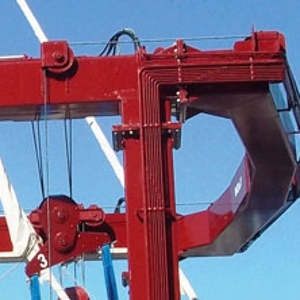 These cranes make boat lifting and transporting easier and safer. The crane operation includes cabin control and remote control. Cabin control travel lift and remote control travel lift have advantages. Cabin control boat hoist is very flexible. The crane is equipped with cabin, the operator sits in the cabin, thus the operator can move together with the travel lift. 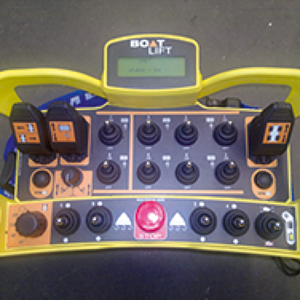 Remote control refers to that the operator controls the boat lift standing on the ground. The operator also has broad and clear vision. He can see the crane traveling clearly. For any abnormal condition, the operator can make decision immediately. Ellsen supplies cabin control mobile boat hoist. 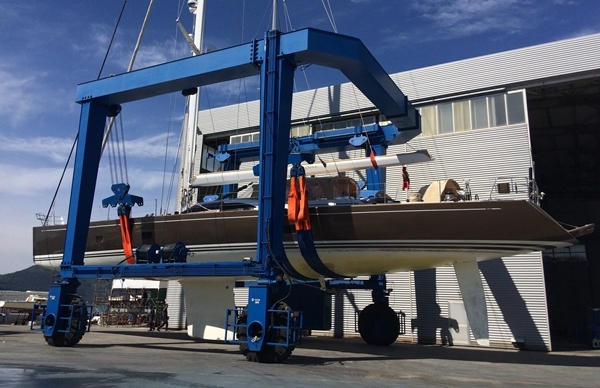 This boat lift can adapt to environment well. The operator sits in the cabin, which can keep him from cold air and hot sunshine. Ellsen also provides remote control boat hoist. Both of them are great lifting device for boat transport. 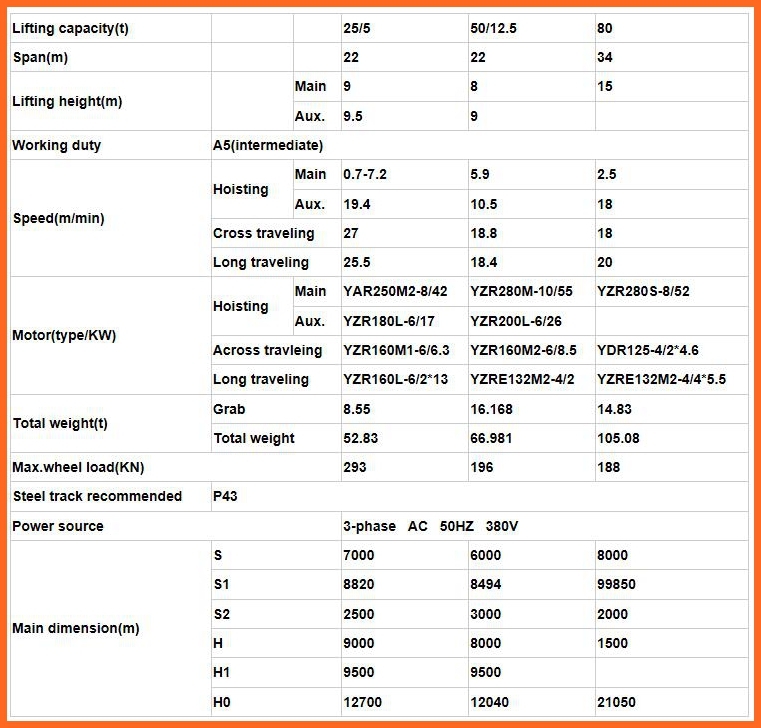 Why choose China 100t marine boat hoist? 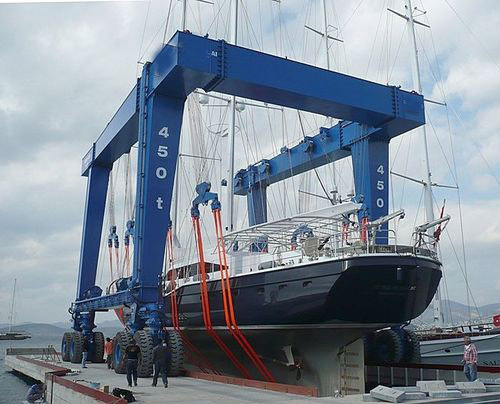 100 tons marine travel lift is a heavy duty boat lift. It has large loading capacity and can lift large boat easily. This kind of boat lift is equipped with complete safety protection devices. These devices can protect the operator from dangers and prolong the service life of the boat lift. Ellsen design large capacity boat hoist with compact structure, which makes heavy duty travel lift can move flexibly. Ellsen designs cranes and produces cranes according to national standards. All producing processes are based on national safety rules. Reliable quality ensures great performance and saves much repair cost for customers. 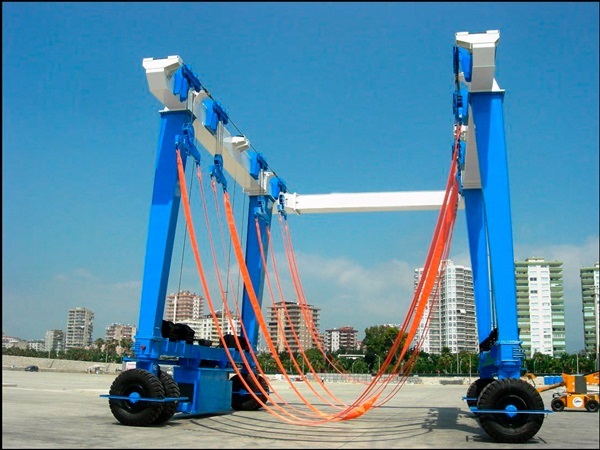 China rubber tyred travel lift is a great device for boat lifting. This cost-effective marine boat hoist can help customers save much cost, because Made-in-China boat hoist has low price and high quality. 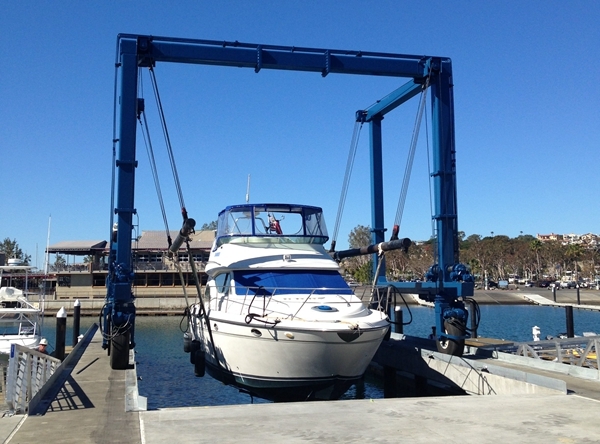 Low purchasing cost, low maintenance cost, cheap China boat lift is a wise choice! For large boat, it is great to purchase cheap rubber heavy duty crane. With durable material, the crane has long service term; with reasonable design, China boat lift can lift boat stably and quickly; with powerful loading capacity, China boat hoist can lift large boat easily and flexibly. What’s more, China light duty boat hoist is also great. The 360 degree traveling makes it move towards any direction.